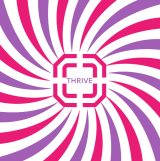 Thrive - Get Involved. Make Friends. Enjoy Motherhood. A MOD Moms Business. Thrive is a product that promotes sleep, increased energy, mood, mental clarity and is a great post workout recovery aide. It is easy to use and will change the way you feel daily. I am not only looking to sell Thrive but wanted to offer other moms out there who are looking to join my team and make some extra cash and earn free products! Thrive has done amazing things for me as a working mom of three very active boys! I will offer $10 off first order of Thrive and $50 off the purchase of a promoter pack to whom ever decides to join my Thrive team and promote!